SISTERS, OR -- Two local irrigation districts are celebrating big steps in water conservation. U.S. 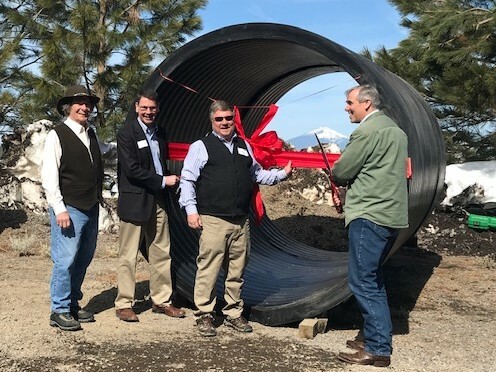 Senator Jeff Merkley (D-OR) was in Sisters Tuesday, to cut the ribbon on large construction projects for Tumalo Irrigation and the Three Sister Irrigation District (TSID). A portion of the funding for construction came from appropriations secured by Oregon’s Congressional delegation. Senator Merkley says the $30 million projects benefit the districts, farmers and the ecosystem, "This gets water to our farms more efficiently, in some cases, saving those farms a ton of money in pumping costs. It also saves a lot of water, which can be shared with the river; which is critical to habitat that has suffered under the rhythms of the modern world." Tumalo Irrigation District Manager Ken Rieck says his agency's piping project changes everything, "I used to start off all my presentations with, ‘for every 100 cubic foot per second (cfs) that we divert, 50 if it gets on farm and the other 50% is lost in the stream.’ I can’t say that anymore because we laid 8400’ of pipe this year, and we’re still laying pipe right now." Over the next 11 years, he believes piping 69 miles of canals will conserve 48 cubic feet of water per second and save farmers more than four million kw hours of energy, because water will be delivered by pressurized pipe. Currently, farmers use pumps to get water from canals. Tumalo Irrigation is also one of the first in the country to develop a watershed plan, with help from the USDA's Natural Resources Conservation Service. Three Sisters Irrigation also cut the ribbon Tuesday on the new Watson Micro Hydro Demonstration Project, where they’re developing on-farm systems for renewable energy production. Currently, the facility geneartes enough electricty annually to power 275 homes. "When we’re completely piped, next year, we will be completely carbon neutral," says TSID Manager Marc Thalacker, "No one ever thought that you could fight climate change with modernizing irrigation districts." He tells KBND News the work benefits farmers and fish, "We have taken Whychus Creek, a stream that we dried up for 100 years, and we now have over 30 cfs of protected flow in there; and my farmers are receiving 25% more water on-farm. So, it’s a win-win for the whole community. And, ultimately, we’ll have steelhead and salmon swimming through Sisters; the last time that steelhead and salmon swam through Sisters was 1885." The projects were undertaken with additional help from Energy Trust of Oregon, which is working with all eight districts in the Deschutes Basin, and Farmers Conservation Alliance. Photos: (top) L-R Betsy Kauffman, Renewable Energy Sector Lead for Energy Trust of Oregon, Matt Lohr, Chief of the Natural Resources Conservation Service (NRCS), Three Sisters Irrigation District Manager Marc Thalacker and U.S. 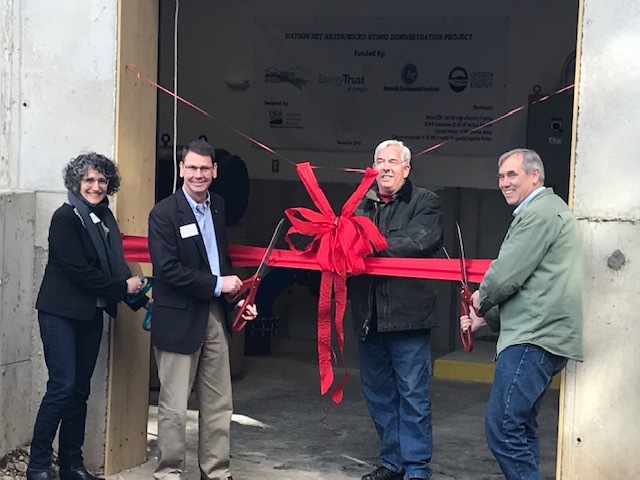 Senator Jeff Merkley cut the ribbon on the new Watson Micro Hydro Demonstration Project, March 19, 2019. (above) Sen. Merkley celebrates Tumalo Irrigation District's major piping project.